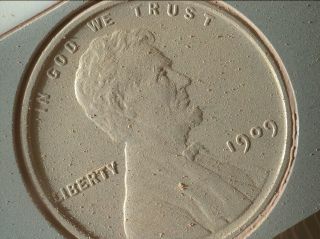 High-resolution image of a 1909 U.S. penny, as taken by the Mars Hand Lens Imager (MAHLI) on NASA's Curiosity rover in northern Gale crater on Mars, Oct. 2, 2013. A penny on Mars has grown rich with red dust while riding on a NASA rover. An ultra high-resolution photo recently sent back from the Red Planet revealed the red cent is covered in Mars dust, despite it being mounted vertically on the space agency's Curiosity rover for the past 14 months. The penny's patina however, was not the primary focus of the photograph that captured its current condition. The six-wheeled Curiosity, which is also referred to as the Mars Science Laboratory (MSL), landed inside Mars' Gale Crater in August 2012 and then spent the next 11 months being checked out while starting science investigations in an area near where it had touched down. It was there that Curiosity achieved its major science objective, finding the evidence for a wet environment that could have supported ancient microbial life. Now into the second year of its planned two-year mission, the rover is trailblazing a path to the base of Mount Sharp, a 3.4-mile-high (5.5-kilometer) mountain that rises from the crater's center. Once there, Curiosity will resume its study into how the Mars' environment changed and evolved. The coin, which was minted during the first year President Abraham Lincoln was depicted on the front of the one cent piece, was flown to Mars as part of a calibration target for the MAHLI. The rover was equipped with the hand lens to take color close-up images of rocks and surface materials at a very high resolution. At 14 micrometers per pixel, the photo of the penny was a demonstration of the imager's best-capable return, Yingst said. A micrometer, also referred to as a micron, is about 0.000039 inches. The image was obtained as part of a test. It was the first time that the rover's robotic arm placed the camera close enough to a target such that it could obtain the MAHLI's highest-possible resolution. Earlier MAHLI images, which focused on Martian rocks, were taken at 16 to 17 microns per pixel. It was not however, the highest resolution photo taken on Mars. Credit for that record goes to the optical microscope on NASA's Phoenix Mars Lander, which touched down in 2008. As a microscope though, fine-grained samples had to be delivered to it to be imaged, whereas the MAHLI on Curiosity can be deployed to look at the geologic materials in their natural setting. NASA's Curiosity rover with inset showing the calibration targets, including a penny, at the end of its robotic arm. The image of the penny was acquired on Oct. 2, Sol 411, or the 411th Martian day that Curiosity has been exploring Gale Crater. As the photo shows in fine detail, the copper coin is dated for 1909. What it does not reveal is what makes the penny particularly rare: the initials ("VDB") of the coin's designer, Victor David Brenner, which are etched on the reverse. Brenner's initials were deemed to be too prominent, and as such were removed from subsequent mintings within days of the penny's initial release. Ken Edgett, who picked out and purchased the penny with his own funds, said that he selected the coin to continue a tradition that began on Earth. "The penny is on the MAHLI calibration target as a tip of the hat to geologists' informal practice of placing a coin or other object of known scale in their photographs," Edgett, principal investigator with Malin Space Science Systems, said prior to Curiosity landing. "Of course, this penny can't be moved around and placed in MAHLI images; it stays affixed to the rover." The penny was also intended as an outreach tool, he said. "Everyone in the United States can recognize the penny and immediately know how big it is, and can compare that with the rover hardware and Mars materials in the same image," Edgett said. "The public can watch for changes in the penny over the long term on Mars."